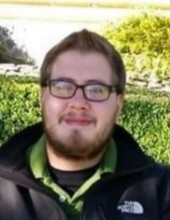 Ethan James Childers, of Rolla, passed away Friday, March 29, 2019, at the age of 26. He was born in Rolla on March 16, 1993 to Matthew Jason Childers and Jacqueline “Jackie” (Gertler) Childers. Ethan was a graduate of the 2011 class of Rolla High School, where he played on the offensive and defensive line for the Rolla Bulldog Football Team. He was an avid sports and Cardinal fan. His greatest pride and joy was his son, Jakson Childers. Ethan loved hard and protected fiercely. This earned him the nickname “Grizzly” at a young age. He was a kind soul and a loyal friend, willing to lend a hand to anyone at anytime. Ethan will be greatly missed by his surviving family which includes his mother, Jacqueline “Jackie” Childers, of Rolla; his father, Matthew Childers, of Rolla; his son, Jakson Childers and his mother and Ethan’s significant other, Kelve’lina Fowler, of Rolla; his brother, Michael Gertler and wife Erica, of Grandview, MO; four sisters, Ashley Bieker and husband Benjamin, of St. James, MO, Kayla Patterson and husband Daniel, Heather Childers, and Amanda Childers, all of Rolla; grandparents, Richard and Sharon Gertler, of Raton, NM; aunt, Jennie Gertler, also of Raton; four cousins and other extended family members and dear friends. A funeral service for Ethan Childers will be held at 1 pm. Saturday, April 6, 2019 at the Null and Son Funeral Home in Rolla. A visitation for family and friends will be held prior to the service Saturday beginning at 11 am at the funeral home. Memorial contributions are suggested to his family to assist with final expenses. To send flowers or a remembrance gift to the family of Ethan James Childers, please visit our Tribute Store. "Email Address" would like to share the life celebration of Ethan James Childers. Click on the "link" to go to share a favorite memory or leave a condolence message for the family.